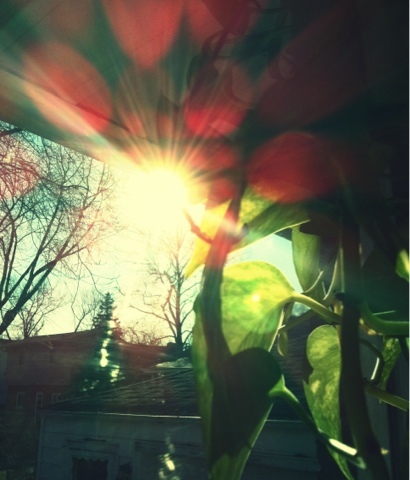 The Mom Standard: Here comes the sun; time to get my writing on! Here comes the sun; time to get my writing on! I am sitting at my cold quartz kitchen counter with a steaming 2 shots espresso and 1/2 cup of regular java homemade peppermint mocha. My morning writing has eluded me since summer. My pen and paper hid themselves in preparation for the horrible, button down the hatches, winter we were suggested to gear up for. Joke is on us--spring is still here! Oh, my first look out the window this morning I see a slight dusting of frost, but even that seems put down just so Jack doesn't lose his job. I look out the window again and see the sun! I feel the sun! It's energy fills the kitchen, waking it up, biting at the bit to make the whole house wake from its slumber, to make my pen and paper come out from hiding. Being in this room writing stirs up my energy-no, its not the coffee that's doing this. My home's kitchen is its heart. It is the brightest room in the house, even when it's dark. When you are in this kitchen you can only feel happy. Even with dishes piled in the sink, the counter cluttered, and the floor needing a good sweep, one knows this home is alive. The heart of it is fully functioning, no blockages, just bright warm light through and through. It's amazing the effects the sun have on us! Fantastic writting. I love those mornings where the light streams in through the windows and all of a sudden I am alive with motivation and happiness. Thanks for the kind words. Even when it snowed it made the kitchen warmer and the sun brighter.